In a research abstract presented at the 2015 American Thoracic Society annual meeting in Denver, CO, Daniel Sullivan, MD, of the University of Alabama School of Medicine in Birmingham, AL, and colleagues report on the by-products of e-cigarette vapor. The team found that some e-cigarettes product more of these potentially harmful substances than others. The researchers found that generation of acrolein, acetaldehyde, and formaldehyde—all potential carcinogens--was correlated with the output of the e-cigarette’s power generating mechanisms. 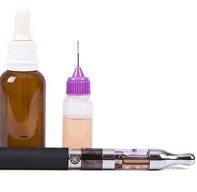 Testing a nicotine formulation used in a product marketed as Johnson Creek original tobacco flavor vaporized by glycerol and propylene glycol, e-cigarette condensate was prepared by bubbling vapor through a phosphate buffered saline solution. Combustion products were derivatized with measurements done via liquid chromatography tandem mass spectrometry. Leukotriene A4 hydrolase (LTA4H) peptidase activity was assessed through colorimetric synthetic peptide degrading at LTA4H activity was measured in human neutrophils exposed to combustion products via an ELISA test. Under certain conditions, Sullivan wrote, hazardous chemical levels found were similar to those seen in tobacco cigarettes. The combustion product formation was also positively correlated with the ratio of glycerol to propylene glycol in the solution being vaporated. Further, e-cigarette condensate was found to inhibit both enzymatic roles of LTA4H, just as it is in cigarette smoke. The enzyme is “critical in the resolution of pulmonary inflammation” he noted. In conclusion he wrote, “for the first time, we show that it is necessary to account for both the mechanical components of e-cigarettes as well as the chemical makeup of their nicotine solutions in understanding not only the generation of combustion products by these devices but also the potential health effects of their use." The findings also point to the need to institute regulations to standardize the manufacture of the devices, as is done for tobacco cigarettes, the team wrote.